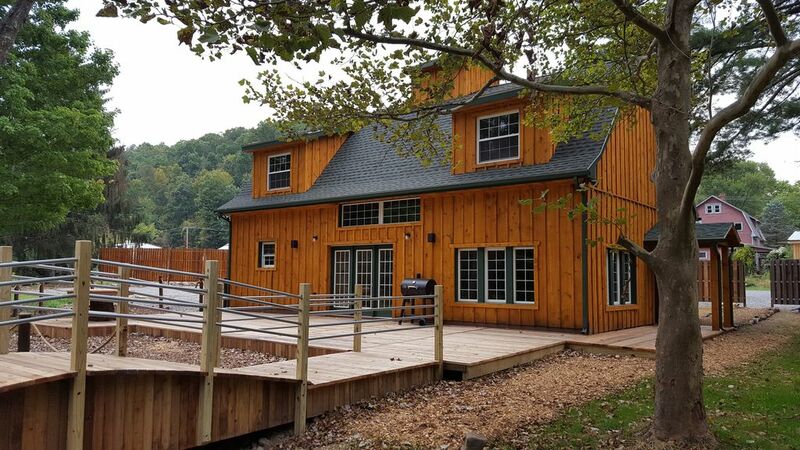 Eagle Creek Lodge is conveniently located in Port Matilda, Pennsylvania just minutes away from Penn State University. We are situated on the banks of The Bald Eagle Creek in the center of scenic Bald Eagle Valley. The lodge accommodates 18 to 20 people and is fully equipped with three surround sound televisions, a custom kitchen and bar for cooking and entertaining large groups. Enjoy the large outdoor patio, fire pit and the ambiance of Eagle Creek’s natural surroundings. Whether you are visiting for a relaxing weekend with family and friends or attending a sports/football event, Eagle Creek Lodge is the place for you. If you are looking for hunting, fishing, or hiking our lodge is surrounded by some of the best opportunities in the state of Pennsylvania. The Scotia Range, Black Moshannon and Bald Eagle State Parks offer public game lands with streams, trails, and lakes to enjoy by all in any of the four seasons. 2 Refrigerators, (1) in kitchen area and (1) in bar area. This is an awesome house. We had about 12 guys in town for a football game at PSU. Close to field and town, everything we could’ve asked for and more. Our stay at Eagle Creek Lodge was amazing! We celebrated our daughter’s 30th birthday on a Penn State game weekend! The lodge has everything you need for a large group. There were 20 of us and two refrigerators were perfect for all the food we had! Two keurigs made breakfast coffee convenient and easy for all. There is plenty of seating and beds and the outdoor amenities are perfect for a bonfire or walk in the woods or just sitting by the creek. The lodge is an easy 15-20min drive or uber ride to downtown State College! We arrived a little earlier than expected, but Mike was there in a minute to show us around and was more than accommodating. We are already booked for a weekend next fall!! Great place for large family for Penn State Graduation Weekend! We had 12 of us stay here for 2 nights for Penn State Graduation weekend! The place is perfect! It was well equipped with everything that we needed to cook, eat, play, sleep and enjoy our stay. It is a little away from the crowds which was nice too! Our graduate was easily able to get an Uber back to campus after hanging out with us each night. There is a nearby store and gas station, and we got take out one night from 2 local restaurants. Mike was friendly and very accommodating. We highly recommend Eagle Creak Lodge. My group recently stayed here to attend the BJC Dual wrestling match between Penn State and Iowa. We had an excellent time at the lodge and were very pleased with the accommodations. Mike, the owner, greeted us to give us an overview of the property when we arrived and showed us all of the features of the property and mechanical systems. The overview was very helpful to start our visit. The property has a huge indoor wood burning fireplace, which was excellent and kept the lodge warm and cozy all weekend. There's also a fire pit outside that's about 6 feet in diameter surrounded by seating, so that was a great place for our whole group to congregate. Two refrigerators were plenty of room to stock all of our food and bar items, and we ended up feeding as many as 18 men for meals during our stay. My overall rating for this property is five stars and we will certainly return if we are planning another guys' weekend in the area. The lodge technically sleeps 21 people, but keep in mind that this number includes two people sleeping in each queen size bed as well as two people on the full size pull out sofa. In terms of number of beds, there are the following. One private bedroom with a queen bed. One queen bed on one side of the loft area. Two queen bunk beds (four queens total). Two triple level twin bunks (six bunks total). So upstairs, there are a total of 12 beds. Downstairs, there is a full size pull out sofa and there is also a love seat where someone small could sleep. The summary of this is there are 14 individual beds if everyone staying in your party wants their own bed. As of February 2018, Google street view does not show this property on the satellite or street view! The lodge was very recently renovated from an old barn, so when you inevitably go to Google maps to look up the place where you will be staying, you won't find it. Not to worry, because the picture on VRBO is a great picture of the main entrance door and back deck at the lodge. There is a beautiful stream behind the lodge. Just about 50 yards from the deck, there is a fishing hole where you could easily catch some fish. We didn't try it ourselves since we had about 8 inches of snow on the ground during our stay, but if you are into fishing, then bring along your rod and tackle and give it a try. There is plenty of parking. We parked at least nine cars at the lodge during our stay and could have fit more. Thanks for the review!! Look forward to you staying with us again! !